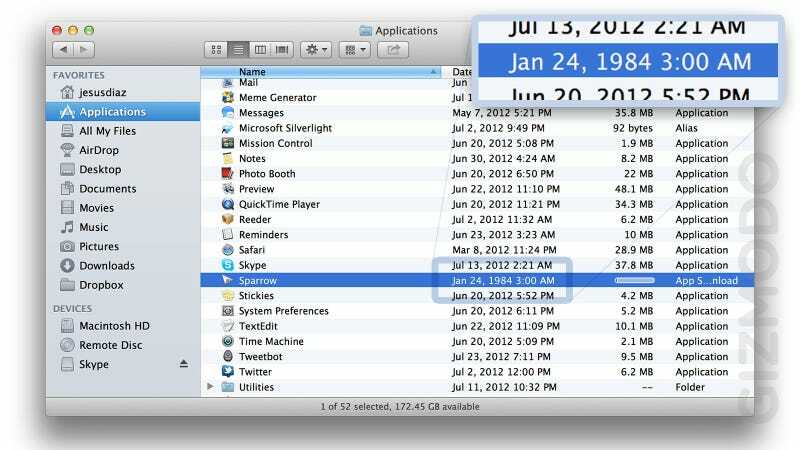 Next time you download an app from the Mac App Store, go quickly to your applications folder and check out the time stamp on the downloading application. It will say January 24, 1984. If this doesn't sound familiar, slap yourself and then watch the video included in this article. Yes, January 24, 1984 is the birth date of the original Macintosh (I have one of these in my living room, manufactured at Apple's Fremont factory, on the 28th week of 1984). After the app downloads completely, the timestamp gets updated to its real timestamp. I love it. Steve Jobs would have liked this. When he returned to his Magic Kingdom, he banned all credits and easter eggs in Apple software. This was a 180-degree change from his policy back in the first years of the company. He justified the credits ban as a way to avoid headhunters and other companies trying to poach Apple engineering talent. At a time when Apple was sinking rapidly, he said that it made no sense to make the life of the competition easier. He also argued that they were all responsible of the stuff they created in Cupertino. This was a complete change from the 1980s. Back then, Jobs encouraged his engineers to sign their work like artists. Every single program included in the Macintosh had an about box that clearly showed the credits. That's how Macintosh users learned about people like Andy Hertzfeld, Bruce Horn, Steve Capps, or Susan Kare. He actually made everyone who participated in the Macintosh project sign the case mold. All the original Macs have the signatures of its creators inside them. Like a painting. That was the ultimate easter egg, but there were software easter eggs too. Along with Wozniak, Jobs loved pranks and fun stuff. Easter Eggs fit perfectly with this attitude. They were a sign of attention to detail and humanity. During the first years of the company, he loved these details and encouraged them. As a result, Apple's software was full of Easter Eggs. It became a tradition for engineers to add these fun hidden details. I remember reading about a new one and quickly going to my Mac to reproduce them. They were fun and some of them were extremely elaborate. One example: If you had a PowerMacintosh with System 7.5, you could type "secret about box" in SimpleText, drag it to your desktop and a cool window would appear. The window showed a 3D flag with an iguana and the text "iguana iguana powersurgius" on it. The flag waved in the air in real time over a picture of Apple's Cupertino campus. Depending on the position of your cursor, the flag would blow in different directions. If you moved your cursor fast enough, you could rip the flag off the mast, sending it flying in the air. But if you waited long enough, the picture of the iguana—who belonged to Dave Evans, one of the engineers—changed to a picture of the development team, with their names scrolling at the bottom of the box. It was a great effect that wowed everyone who saw it, and showed the power of Apple's new chips: back then more powerful than their Intel counterparts. But for the returning once and future king it was too much. By Mac OS 9, all easter eggs had been removed from the operating system and applications. Jobs' ban had a simple justification for him: Engineers waste too much time on these, and they don't add anything to Apple products except a heavier disk footprint.